Attractive machine stands, featuring steel frame and translucent polycarbonate panels, add a touch of class to your office area. Generously sized laminate top accommodates most office machines. 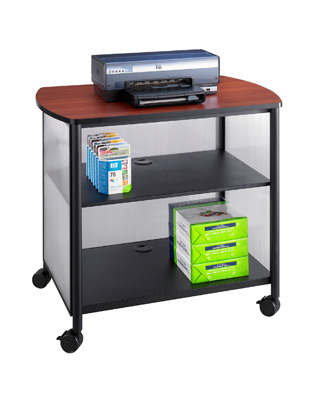 Storage with one fixed interior shelf underneath for office supplies. Includes cord management. Black powder coat finish has a Cherry top. Four swivel casters, two locking.